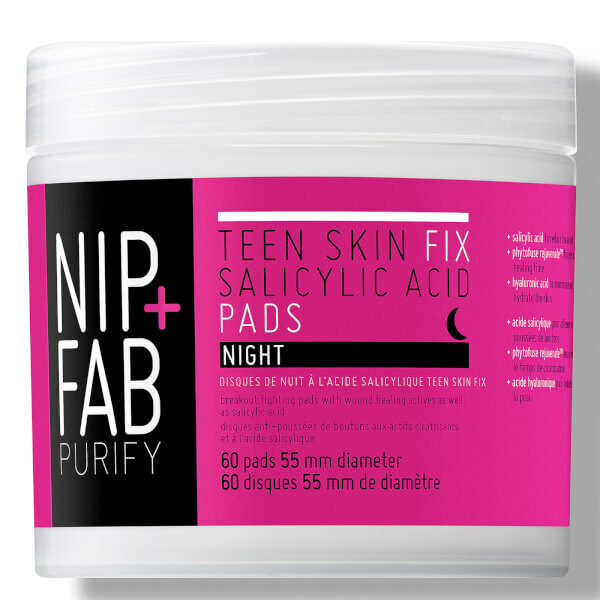 Catch some Z’s in peace knowing you’ll be rising with clearer, calmer skin with the NIP + FAB Salicylic Acid Night Pads from the skincare and makeup label’s best-selling Teen Fix range aimed at oily, blemish-prone skin types. Supercharged with powerful antioxidant and antimicrobial agent Wasabi extract, the breakout-fighting range helps to remove acne-causing bacteria, eliminate excess sebum and zap spots. 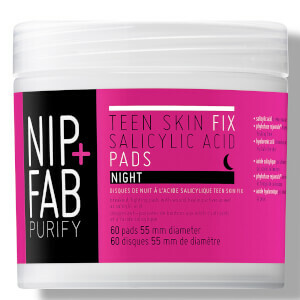 The single-use pads are saturated in blemish antidote Salicylic Acid, Lotus Flower extract and a protective complex to help support the healing process of active flare-ups and speed up recovery time. Dehydrated skin overcompensates with increased sebum levels, so Hyaluronic Acid is utilised to deeply quench the complexion and regulate production. Wipe one pad over entire face. Use every evening on clean, dry skin. Use 2-3 times weekly on sensitive skin. Avoid direct contact with eyes. If eye contact occurs, rinse well with lukewarm water. Aqua (Water), Glycerin, Butylene Glycol, Propylene Glycol, Salvia Hispanica Seed Extract, Salicylic Acid, Propanediol, Phenoxyethanol, Benzyl Alcohol, Parfum (Fragrance), Aloe Barbadensis Leaf Juice Powder, Disodium EDTA, Panthenol, Sodium Hydroxide, Lactobacillus Ferment, Benzyl Salicylate, Dehydroacetic Acid, Sodium Hyaluronate, Nelumbo Nucifera Flower Extract, Nymphaea Coerulea Flower Extract.